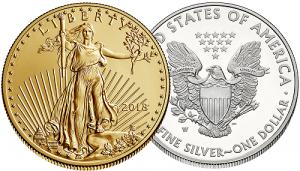 HomeGold IRA BlogBuy GoldVolatile Stock Market Accelerates Gold and Silver 2019 American Eagle Coin Sales! The media badmouthing of gold and silver bullion that was unleashed by central banks throughout 2018 effectively stunted American Eagle coin sales last year. But so far this year, American Eagle gold and silver bullion coin sales are well ahead of last year’s January sales totals. An incredibly volatile stock market could be a big part of the reason for that, or growing global economic uncertainty, or perhaps the realization by many investors that all the while deterring investors from precious metals purchases in 2018, central banks were well on their way to becoming the year’s biggest bullion buyers. Meanwhile, news reports coming out of the annual World Economic Forum in Davos, Switzerland are suggesting a rather gloomy picture for the coming year. So, traders are eagerly awaiting news from today’s regular monetary policy meeting of the European Central Bank, by way of ECB President Mario Draghi’s press conference. 2019 is going to be a difficult year, Call American Bullion, at (800) 653-GOLD (4653), in order to acquire gold and silver for your IRA or old 401(k) before prices start rising again.